The desire to look young and beautiful is something that’s always been highly sought after in all times of history. We’ve always been looking for ways to curb the effects of aging, whether it was the cosmetics that the ancient Egyptians used, or the search for the mythical Fountain of Youth. Fortunately, these days, we have all kinds of ways of fighting the effects of aging, and botox treatment is one of the most prominent. However, there’s a caveat — botox treatment must be administered correctly, and you have to do your part to make sure everything settles as intended. 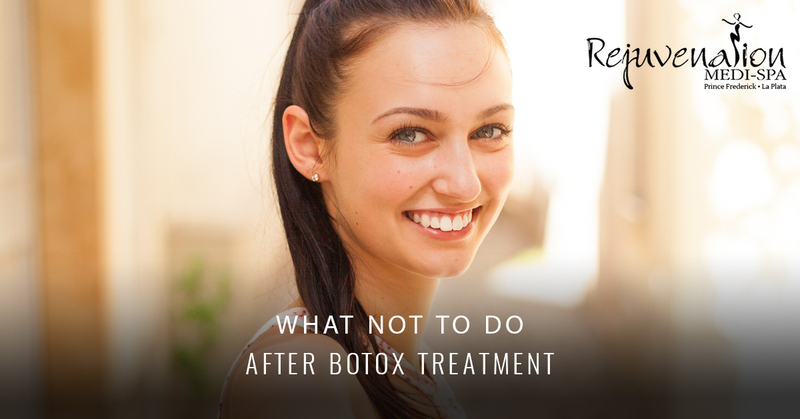 Indeed, there are ways that you can affect the outcome of your botox treatment for the worse, so it’s important to know what not to do after botox. After all, it’s easy to be misinformed about botox, so it’s good to know all the facts going in. The first and foremost rule is this — no touching! Botox, essentially, is an injection that paralyzes certain muscles in your face to prevent them from sagging. This reduces wrinkles, but it doesn’t work if they’re affecting the wrong muscles. We take every step we can to ensure that our botox treatments are administered as professionally and precisely as possible, but it doesn’t remove the possibility of things getting messed up if your face is continually touched. Touching your muscles can affect the injection, and in worst-case scenarios, move it to other areas of your face. The last thing you want is a botox treatment that affected the wrong areas of your face, so do yourself a favor and keep your hands away. While the recommended time period varies depending on who you get treatment from, we recommend not touching your face for 24 hours if it is at all possible. It is advised that you wait at least 24 hours after botox until you partake in physical fitness, though many people wait for even longer just to keep it safe. The first reason that you want to avoid physical activity is the likelihood that you might bruise yourself. While we’re confident that you probably don’t make a habit out of falling on your face during your workouts, it’s better to be safe than sorry — facial impact and bruising won’t play well with your botox at all. Secondly, the high-intensity movement in a workout could cause the botox injection to shift to other muscles, which, as we clarified in the last point, is an undesirable outcome. Painkillers and Alcohol both have a similar effect which should be avoided at all cost — they thin the blood. While this is acceptable under normal circumstances, it’s a no-no after botox because it can worsen the bruising that may or may not come after your treatment. While it doesn’t always happen, it’s not uncommon for bruising to occur, and you want to do everything in your power to make it worse. So, if you were planning on having some wine with the ladies, it might be best to postpone those plans until the next day. If you really want to play it safe, it wouldn’t hurt to abstain from alcohol and painkiller for a few days. First and foremost, you’ll want to avoid laying down altogether for at least four hours. The procedure is carried out with vertical alignment in mind, so you’ll need to stay that way until the treatment settles in. Four hours is the baseline, but like most of the other things on this list, it won’t hurt to go for more if you don’t have a compelling reason to lay down. Once you do lay down, try to sleep on your back. This might be the challenge of a lifetime for stomach and side sleepers, but you’ll regret pressing your face all over the pillow if it ends up having an effect on your botox treatment. Are you looking to get a botox treatment? Our professional team at Rejuvenation Medi-Spa would be happy to carry out the treatment. We have extensive experience in administering botox treatments and we can guarantee that we’ll perform the procedure with expert precision, leaving you with a face that’s young, beautiful, and wrinkle-free. Any age is a good time to get botox, and we’ll help to determine how the treatment could affect you. Our Maryland medi-spa is located in Prince Frederick, but we’ve accommodated clientele from all the surrounding areas. Whether you’re in La Plata, Leonardtown, or other surrounding areas, we know you’ll be satisfied if you come to Rejuvenation. Contact us today!